The iPhone can be noisy and beeps and chimes announcing the arrival of a message or email, or some event in a game, can disturb your sleep. One solution is to turn off the sound, but then your sleep might still be disturbed with the screen turning on if the phone is on the table beside the bed. However, with Do Not Disturb and Bedtime you can get a good night’s rest. You might want to enable Do Not Disturb during meetings at work because the noises and screen activity can be distracting both for you and other people at the meeting. DNF enables you to have a distraction-free meeting. There are more scenarios and these days cinemas tell you to turn off your phone during the movie. Instead of doing that, you could enable DND mode. Driving a car is another occasion when you don’t want to be disturbed by your phone because it could be dangerous. People have had accidents while texting and driving. You could schedule DND to activate during the night when you are asleep and for this the Bedtime switch should be on. Some people may want to schedule DND during the day. For instance, if you are working and don’t want to take personal calls on your iPhone, DND could be enabled from 9 AM to 5 PM, or whatever your work hours are. Family is a good one to choose and it means that you can still receive phone calls from your partner, children, parents and so on, even in the middle of the night if necessary. You won’t get calls from your boss at work though. However, if you want to allow your boss or anyone else for that matter, select Favourites. The problem with choosing the Automatically option is that the iPhone may not be able to tell whether you are in the driving seat of your car or the passenger seat of someone else’s, or even travelling on a bus. It might automatically enable DND because rapid movement has been detected. There are more settings for driving with your iPhone a little further down the DND settings. You don’t need them if you have a hands-free system in your car and can receive calls without taking your hands off the steering wheel or your eyes off the road. 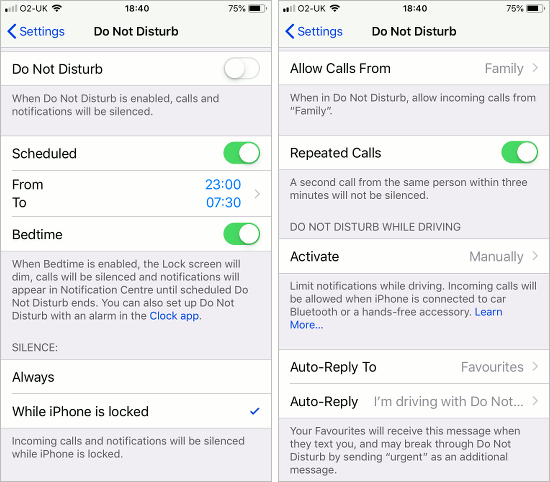 If you cannot or don’t want to take calls while driving, and you really shouldn’t, press Auto-Reply To and select one of the options, such as No One, Favourites, All Contacts and so on. An automatic text message reply is sent to anyone that calls you while DND while driving is active. If you choose to Auto-Reply, press it and tap the text message to edit it. 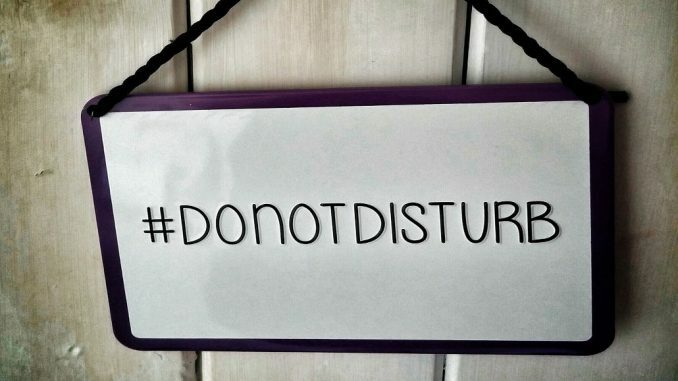 Suppose you are at work, watching a movie at the cinema, or some other place and enabled Do Not Disturb. Wouldn’t it be useful if DND could be automatically disabled to return to normal mode when you leave work, the cinema or wherever you currently are? You can. Open the Control Center (swipe up from the bottom or down from the top, it varies with the iOS device), and press and hold on the Do Not Disturb button – the moon icon. Use the force touch method if you have it. A list of options appears that enables DND for one hour, until tomorrow or until you leave this location. What is Bedtime on the iPhone? 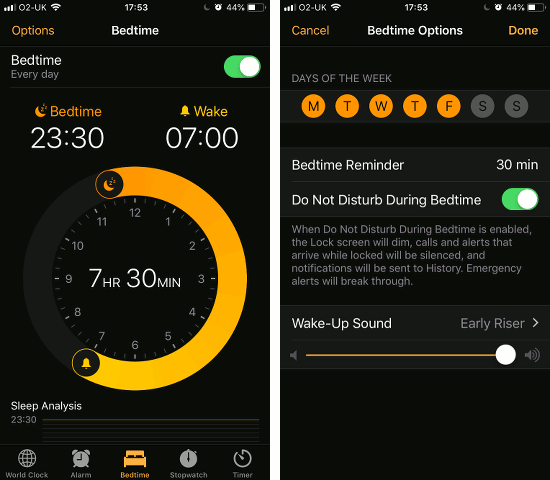 Bedtime is a new type of Do Not Disturb function in iOS 12 that is specifically aimed at helping you get a good night’s sleep by turning off or limiting the screen, calls, and notifications. There is a Bedtime switch in Do Not Disturb and a Do Not Disturb switch in Bedtime. They can be independently turned on or off, which I think makes the feature a bit confusing. Do Not Disturb: Focuses on silencing your phone by preventing calls and notifications from making sounds. Bedtime: Dims the Lock screen and stops notifications from lighting it up. Notifications are sent to the Notification Center and not the screen. Bedtime plus DND is a sort of super DND that is aimed at night time use, whereas ordinary DND can be used during the day, such as driving a car, business meetings and so on. 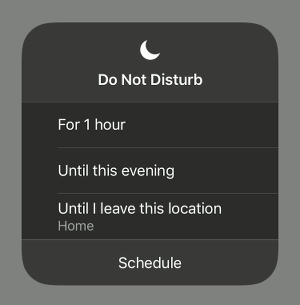 Bedtime can be turned on in Do Not Disturb settings if your scheduled DND corresponds with your sleep hours. However, this can also be configured in the Clock app and there is a tab at the bottom of the screen to select Bedtime. Bedtime has an option to remind you to go to bed and some people may find this useful. I keep falling asleep in front of the TV and don’t need to be reminded. It can also wake you up with an alarm in the morning and this is obviously more useful.